Lovebirds symbolise romantic love. Pretty little parrots in vivid shades of blue or green they snuggle and cuddle together. Lovebirds make a nest together and mate for life. They like sitting touching for long periods of time. They are affectionate and playful. Birds signify freedom, inspiration and transcendence. 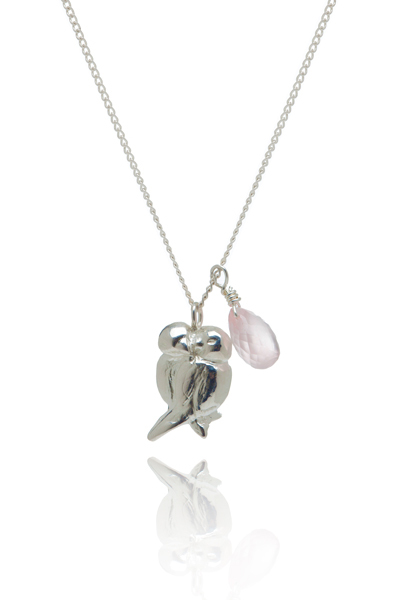 Lovebirds symbolise commitment, true love, romance and a playful spirit. Called the heart stone this is the stone of unconditional love. Rose quartz attracts new love and relationship to those who are single and creates a sense of harmony and joy in an existing partnership. A beautiful pink stone that warms the skin around it. Rose quartz will ease the pain of the past and soften the hearts we harden to protect ourselves from pain. Soothing away emotional trauma and mending broken hearts this stone increases self esteem and encourages self love and care. Rose quartz opens us up to receive the love that we all deserve. Also a wonderful gift for a new mother as rose quartz is a mothering stone that has been used when babies are born to ease their transition from the womb to the world. Lovebirds symbolise romantic love. Rose quartz is the stone of unconditional love. Use this talisman to heal past wounds and attract love into your life by opening your heart. Celebrate your love with this necklace and strengthen the joy between you. The LOVE necklace is about happiness, love, relationship and connectedness.